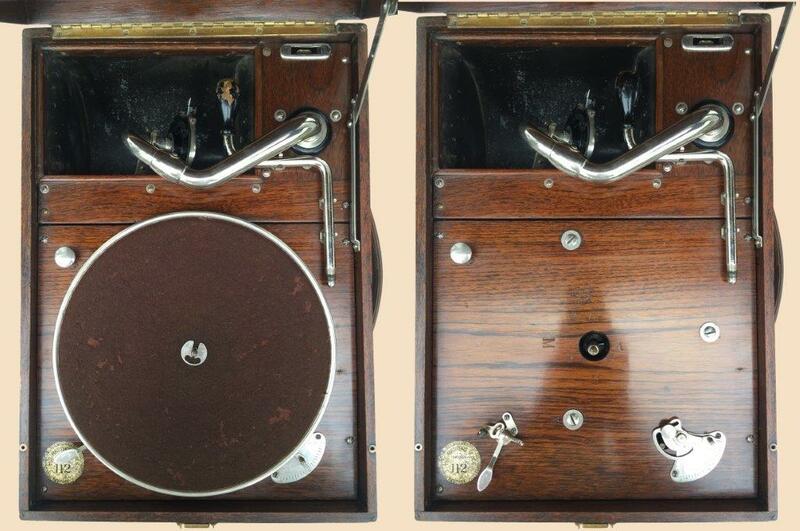 The HMV portable gramophone model 112 is a so called colonial model, because it was only available in british-india. It be based on the model 101 but has a No. 32 double-spring motor and thus its case was much deeper to house the larger motor. 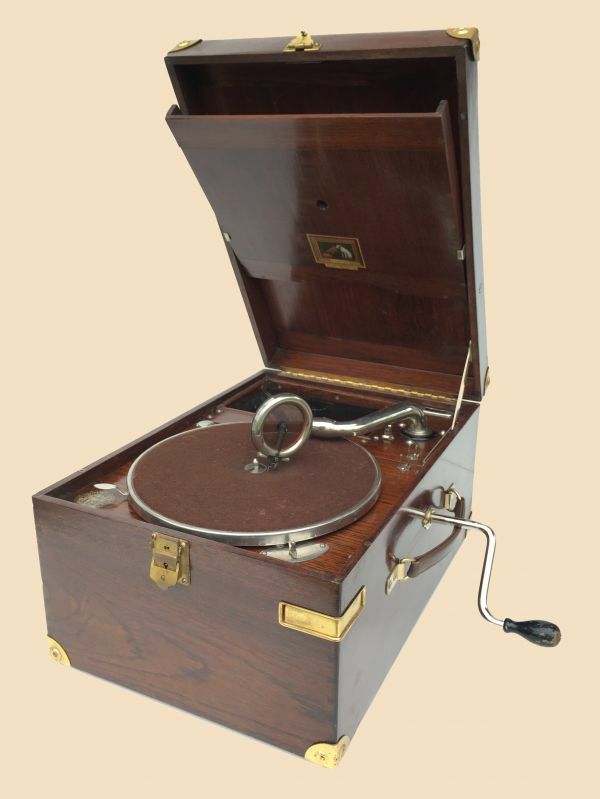 This includes the model 112 of the Gramophone Company of India shown below. 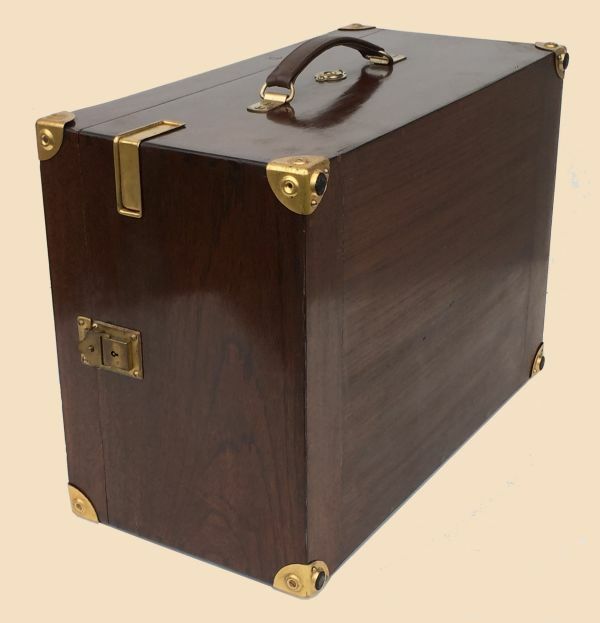 It is based on parts of the famous portable model 101 and was available from about 1928-1933. Due to the HMV No. 32 double-spring motor, it had a much deeper case. Because of the weight and the size it was certainly not an ideal portable machine. The Gramophone Company realized that such a heavy and bulky machine would be unsuitable to european conditions. So this model was not adapted to the home-market. Nevertheless, the Gramophone Company of India produced a successor to the 112 model - an equally heavy and bulky machine, based on the successful portable model 102 - the portable model 114. 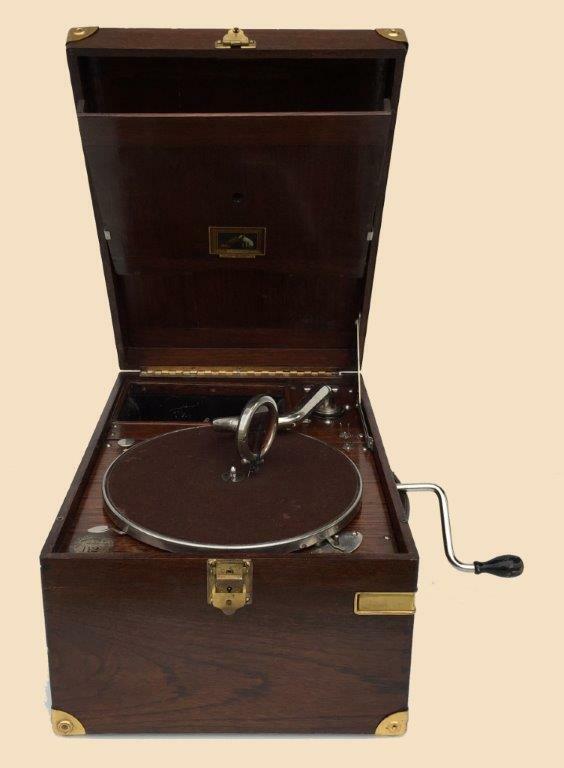 Dazu gehört auch das nachstehend gezeigte Modell 112 der Gramophone Company of India Ltd. Es basiert auf Teilen des bekannten Modells 101 und war von ca. 1928 bis 1933 erhältlich. Auf Grund des HMV No. 32 Doppelfeder-Motors hatte es einen höheren Korpus. Wegen des Gewichts und der Größe war es sicherlich kein ideales Koffermodell. Das veranlasste die Gramophone Company dazu das Modell 112 ausschließlich für den indischen Markt zu produzieren, denn auf dem europäischen Markt wäre solch ein schweres und klobiges Koffergerät sicherlich schwierig zu veräußern gewesen. Trotz dessen fertigte die Gramophone Company of India einen Nachfolger des Modells 112 - ein ebenso schweres und klobiges Koffermodell, basierend auf dem erfolgreichen Koffermodell 102 - das Koffermodell 114. The model 112 was available outside either with nickel-plated or with gilt fittings. 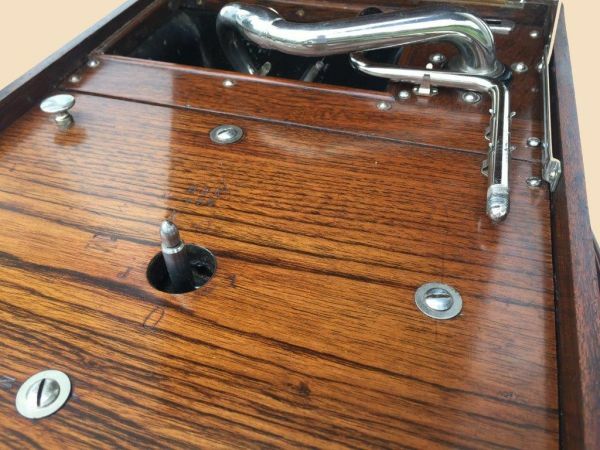 The interior parts such as tone arm, brake, quadrant speed control were always nickel-plated. Thus it plays a special role among the HMV-models, because I know no other model, where the parts have been combined in this way. An interesting fact is that the parts used with the model 112 do not comply with the scheme using the model 101. The soundbox of these early machines (and I already had two) is an early soundbox No. 4. In 1928 already the third version of the soundbox No. 4 was in use. And also the Pakawa-carrying handle was already available and replaced the old handle bracket from 1924-1926 which could be seen on this model. Actual compared to the model 101 are the Tungstyle needle-slot as well as the two-flap-lid catch. 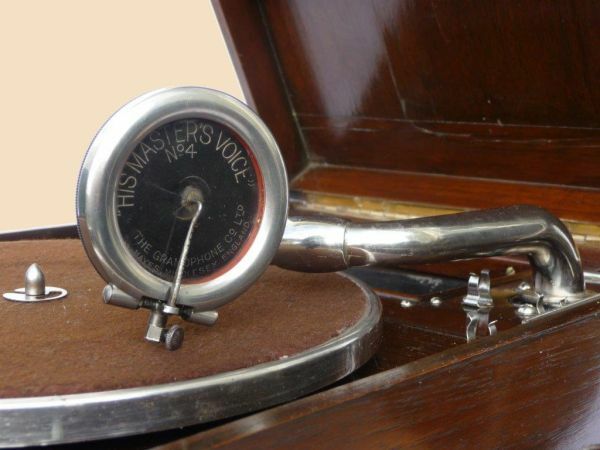 The Model 112 usually has the about 1927/1928 introduced "gold-disc"-transfer. It is rather badly placed, next to the break lever. Under normal use of the brake, usually the transfer is worn down.